SimplePay currently supports integration with Xero. You will be able to import your chart of accounts into SimplePay and then specify mappings from SimplePay’s accounts to your accounts in Xero. Once you’ve enabled this integration, the Pay Runs screen will contain links for posting finalised pay runs to Xero. 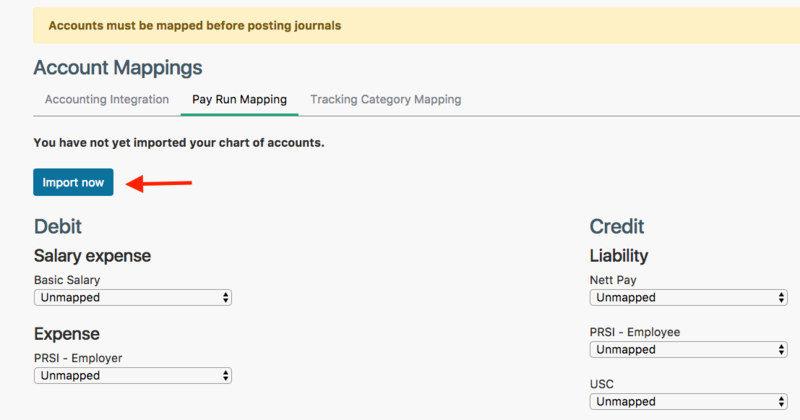 After clicking that, you will be prompted to import your chart of accounts and do the mapping. Before integrating with SimplePay, you will need to ensure that Xero is correctly configured in order to be able to map accounts. You will need to create certain accounts in Xero to be mapped to SimplePay – any account in Xero that has a lock next to its name is not accessible by SimplePay e.g. the Wages Payable liability. You will, therefore, need to create your own custom accounts for these transactions; for example, you will need to create a Liability account to map to salaries and wages payable. You will also need to set up the relevant expense and liability accounts to map to any Revenue transactions, such as PAYE and USC. Once you have created the relevant accounts in Xero, you can proceed with the Xero integration. 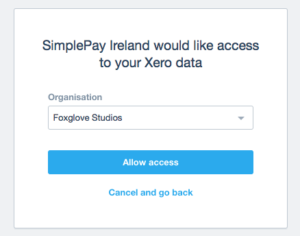 This guide will help you set up the integration between SimplePay, the online Irish payroll system, and the Xero online accounting system. This option posts nett pay to an account as a manual journal. This option creates a salary bill / invoice that you have to pay. The nett pay is not posted but is rather calculated as the balancing amount. Furthermore, you will be able to post your Euro payroll to a bank account that is in another currency, e.g. USD. For both these options you will usually have to do a reconciliation using clearing accounts. Note that, so far, no communication between SimplePay and Xero has taken place. This step is not specific to the Xero integration, but a general function of SimplePay. Click on Pay Runs. First, you will need to finalise the payslips for the period. If your screen does not have a 0 under Pending as illustrated below, you may click the Finalise link which will appear under the number of pending payslips, in order to do a bulk finalise. Then click Create Pay Run. After performing the above action, you will be prompted to map your payroll accounts to Xero accounts. Under each payroll account, you will find a drop-down list of potential Xero accounts that it can be mapped to. You will then authorise SimplePay to access your data on Xero. This authorisation will be remembered in future – it can be revoked at any time from within Xero. You will now be back on the Account Mappings screen shown above, but this time the list of Xero accounts will be populated.The list of Xero accounts that appear in the dropdown list when mapping payroll accounts will depend on whether the item to be mapped appears under the Debit or Credit section on the Account Mappings screen. For instance, the dropdown list for Basic Salary will show asset and expense accounts in Xero, since these are the accounts that are usually debited in accounting. However, you can map to any type of account by clicking on ‘Show More Accounts‘ under the ‘Other’ section in the dropdown list. After mapping the accounts, you will be able to post the journal to Xero. In future, you will not be asked to map accounts. However, if you’ve started using a new payroll account since the last time you posted data to Xero; for example, if you are now paying sales commission for the first time, you will be asked to map that account. This is because SimplePay only maps accounts that you’ve actually used, saving you the trouble of mapping accounts that you may have on paper but never actually use in practice. The above information is applicable in the standard case – where you wish to integrate your company in SimplePay with one company in Xero. This would be applicable to most businesses.